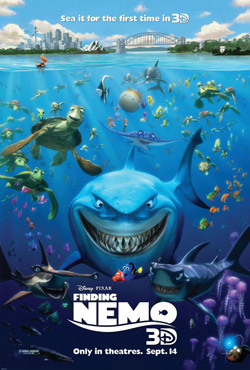 Watch the Movie Trailer for Finding Nemo 3D. Albert Brooks, Ellen DeGeneres and Alexander Gould star in the 3D re-release in theaters for a special limited engagement. Finding Nemo tells the story of a clownfish named Marlin (Brooks) and his son Nemo (Gould). Fearful of the ocean and its unpredictable risks, he struggles to protect his son. When Nemo is unexpectedly taken far from home and thrust into a tacky dentist’s office fish tank, Marlin finds himself the unlikely hero on an epic journey to rescue his son. MPAA Rating: (G) General Audiences. Academy Award-winning Best Animated Feature “Finding Nemo” returns to the big screen for the first time ever in thrilling Disney Digital 3D. In this stunning underwater adventure, with memorable characters, humor and heartfelt emotion, “Finding Nemo” follows the comedic and momentous journey of an overly protective clownfish named Marlin (voice by Albert Brooks) and his son Nemo (voice by Alexander Gould) — who become separated in the Great Barrier Reef when Nemo is unexpectedly taken far from his ocean home and dumped into a fish tank in a dentist’s office. Buoyed by the companionship of Dory (voice by Ellen DeGeneres), a friendly-but-forgetful Pacific regal blue tang, Marlin embarks on a dangerous trek and finds himself the unlikely hero of an epic effort to rescue his son — who hatches a few daring plans of his own to return safely home.